The following cases were determined in the June 18 session of Cardington Mayor’s Court. Kelsey K. Ofarrell, Edison, speed, 35 mph in municipality, guilty assessed fines and costs. 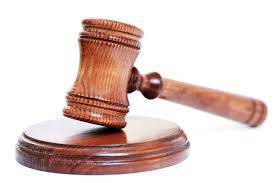 Gregory B. Mattingly, Galion, speed, 25 mph in municipality, guilty, assessed fines and costs. Katelyn A. Stine, Cardington, dogs and other animals running at large, guilty, assessed fines and costs.